Home water filters are one of the most revolutionary inventions in the home appliances. Drinking water is the basic human need to stay fit and healthy. It is one beverage that is irreplaceable by any other product in the world. It is important that every human being has access to healthy drinking water, which means that the water that you consume should have a reasonable pH value, and should be free of all bacteria and contamination. While nature has bestowed the planet with all kinds of fresh water sources such as rivers and lakes, unfortunately, irresponsible human activity has resulted in massive water pollution. As a result, the water that is supplied to our households is often hard with excess fluoride, salt and lead levels along with other harmful contaminants. While the water supplied to our households can be used for other domestic purposes, it is often unfit for human consumption which is why most people resort to bottled water. Although bottled water companies claim to provide healthy drinking water, the fact is that the container is made of plastic, which is neither human-friendly nor environmentally friendly. 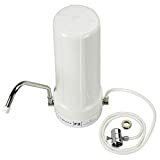 Home water filtration systems are an excellent solution to this problem since these systems purify water supplied to your home without causing any harm to your body or the environment in the process. Although there are many large walls mounted, sink and faucet integrated filtration systems, many people do not have the luxury to get such systems installed. In that case, countertop water filters are a great solution. As the name suggests, this equipment can easily be placed on your kitchen counter and can be moved elsewhere as per your need. Here are some of the top countertop water filters that you can consider for your household. The problem with most water purifiers is that they end up altering the taste of water in the process. That is something which does not happen with this equipment by Royal Berkey. 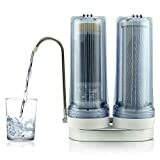 This water filter will purify your water effectively without causing any change in the original taste of water. It can purify water from various contaminants such as pesticides, nitrates, fluoride, and many other substances. It can store up to 3.5 gallons of water and can filter about 3000 gallons of water before a filter replacement is needed. This water filter is exceptionally effective for those health-conscious customers who prefer alkaline water over regular pH value. 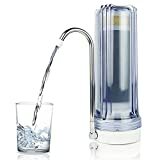 This filter does not only purifies water against 99% contaminants but also has a very modern aesthetic design that looks beautiful as it sits on your kitchen counter. It requires very less counter space and the equipment has an added feature of adding minerals to your water after the removal of contaminants. This equipment has a very interesting filter design that will fit even the smallest counters easily. For the size, it is an effective filter that can purify the water for up to 93% of fluoride, chlorine and many other contaminants.